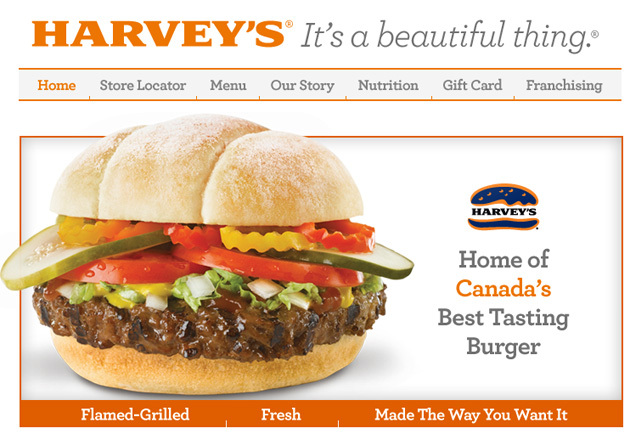 At Harvey’s we’ve been proudly serving Canadians since 1959. As the home of Canada’s Best Tasting Burger, we pride ourselves on delivering the perfect burger experience. Each of our hamburgers are made with select cuts of high quality beef that are combined with a unique blend of carefully selected spices and seasonings. Our Harvey’s Grillmasters charbroil every hamburger to perfection on a flame grill. Then, we let you select from 6 bowls of freshly cut garnishes to top your burger just the way you like it. Come in today for your custom experience. At Harvey’s there’s a burger with your name on it!